This blog has recently been transferred over from my original tumblr (now inactive) and will continue here on my website. I am currently working on a newsletter for my followers that will announce blog updates, and I am also updating my social media pages which will include blog announcements so you do not miss any posts. Thank you for your patience as I improve my web presence! The Beginning Knowledge Book of Backyard Birds was a nice find for $1 at my local library’s sale rack. I was drawn to its cover which features a family of Red-headed Woodpeckers, a Connecticut species I am fond of and one that sparks nostalgia in me. I have not seen one in person since I was a child and these days if anyone ever tells me they spotted one it always turns out to be the ubiquitous Red-bellied Woodpecker — 100% of the time. According to the Connecticut Audubon Society, Red-headed Woodpecker populations have gone down 70% in the past 50 years due to habitat loss — hastening a decline that began with the chestnut blight of the early 1900’s which wiped out a significant part of their food supply. The chestnut blight entered the Eastern US from Japan on nursery plants that were delivered to the Bronx Zoo in 1904, making it a human-facilitated invasive pathogen that species like this woodpecker were not equipped to deal with. This woodpecker has lost a lot of ground here in New England due to the interference of humans through trade and land development, and unlike their more urbanized relatives the Downies and Red-Bellies it seems that they must thrive in areas of lower impact and perhaps do not share the same fondness for feeders. Looking back at my old neighborhood I remember it through child’s eyes as a woodland wonderland, but when I last drove down our street I saw that a large swath of land that was once tangled and wild has been cleared to make room for open lawns and bland, hulking houses. Fortunately the Red-headed Woodpecker has received attention and conservation efforts and there are more stable populations elsewhere, but in Connecticut they remain on the state endangered species list. I confess I did not crack open this book more than once or twice since purchasing it — beyond the cover it did not really call out to me and the illustrations fell kind of flat. Upon opening it again to start this blog entry I was surprised to see that Guy Coheleach was the illustrator; apparently I hadn’t even bothered to look at the byline when I first picked it up, I might’ve given it more attention if I was aware of the name on it. Coheleach is a famous wildlife artist and is especially well-known for his paintings of African animals and big cats. This book’s publication date in 1964 sets us well back into Coheleach’s early career at age 31, two years before his first trip to Africa. This information reframed my experience of the artwork in this book — I’m making some assumptions but my impression of his work in this book has the feeling of one of those projects we take when we are still “figuring things out” as artists. Coheleach grew into a true master and still going strong at 86 years old, don’t give up if you are going through those searching years yourself as it can be the beginning of great things. Here is another book with fully illustrated endpages and these feature a very simplified anatomical diagram of a robin bringing a twig to a nest. This fellow, as with some other birds in the book, is suffering from “Egyptian perspective” — head and feet are flattened in profile while the rest of the body and torso are askew. I’m not bringing this up to roast our (beloved) artist, it’s a widespread and tempting mistake for all bird illustrators at any level that I thought would be worth noting — for what better way is there to show our viewer as much structural information as possible than to pull all the pieces out of hiding and into clear view? This piece is a good example of what can go wrong if we fall into this habit. Not only do we trade the bird’s natural posture and movement for flat rigidity (“fly like an Egyptian”), we end up painting ourselves into a corner as there is always a structure that won’t fall in line. In this illustration it is the open wing being forced into extreme foreshortening — the information about this structure has been entirely sacrificed for the sake of putting everything else on display and gives us an awkward end result. This is one reason why most anatomical diagrams do not make an effort to double up as an illustration about behavior activity, and why bird diagrams favor the use of multiple angles instead of trying to cover everything in one view (Sibley’s are excellent examples of this). Another Egyptian Perspective bird here — in this example the foreshortening of the nearest wing and the tail are well-executed and it’s now the legs that get pulled into distorted, confusing perspective. My favorite pages of this book are actually the simplest ones: just a handful of introductory pages featuring tiny paintings embedded in each line of text. It’s very appealing and cute, it brings to mind a heart-warming image of a parent reading to a child as their finger traces the lines of text so that when they read the name of each bird they skim along the corresponding image. It makes the book more interactive and valuable to very young readers. I remember seeing pages like these when I was a kid but I have to admit that looking at them now they are rather like our modern emoji. 1964 meets 2019. The Northern Flicker and Evening Grosbeak have my favorite full page illustrations. The rendering on this Flicker’s body and the full use of the page in its composition make this one impactful to my eye. The grosbeaks are very informative with a food source present and our female in a much more successful pose than the earlier pages I posted. The feather detail and depth on the flicker are very inspiring, this is an ornate and difficult species to illustrate and the detail of these stacked patterned feathers is very lovely — his body is the most richly defined form in the book, in my opinion. I also like the little offshoot of the tree, the light hits it very nicely and it informs the viewer that this is a dead snag which gently provides more natural history information about the subject. Most of the graphite drawings accompanying the non-color pages are not as appealing to me and feel a bit lost, several of them are a bit disproportionate or dreary. Frankly it’s a little reassuring to see a few frumpy birds in the history of such a standout artist, since I have many frumpy birds of my own under my belt. In the end this is a sweet little book and I am glad to have spent more time with it. I am in the process of adding audio versions of my blog posts, a few have been posted so far if you would like to revisit some of the older entries. I apologize that they are not of the best quality, this is my first time doing audio editing and I hope to improve with practice. For now they are a tiny bit choppy but I hope they will still be helpful to those of you who require them. Since bringing Minn of the Mississippi into my collection some other little picture books have found a home on my shelves. 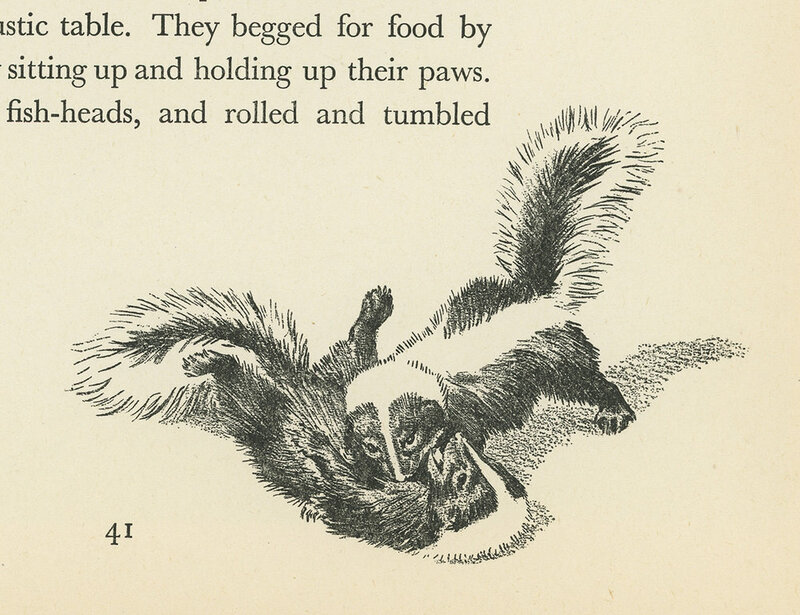 One surprising find was Homes and Habits of Wild Animals — a true vintage piece from 1934 with exceptional illustrations from Walter Alois Weber and text from Karl Patterson Schmidt. My first impression from the cover was that this would be a quaint woodland storybook — it looks like two fawns striking up a friendship with a squirrel in a scene reminiscent of Disney’s Bambi. Opening to the endpages, however, reveals a much more serious and traditional wildlife art style featuring an array of solidly rendered mammals in reddened graphite. As I have seen in many older books, and frankly still in many people’s vocabulary today, the term “animals” is often used to indicate mammals rather than the animal kingdom as a whole. As these endpages suggest, the entire book describes the homes and habits of mammals alone and other animals are only referenced in passing as prey or predators. As with Minn, the book delivers its information in a writing style that is palatable to both young and adult readers and contains a generally balanced level of anthropomorphism. Although Schmidt felt a need to dedicate multiple pages to describing the “wolverene” as a gluttonous, evil creature, most of the book describes the natural charms of wildlife in terms that are relatable to the reader without making such dated moral judgements. Weber's black and white illustrations tucked into the corners and margins around the text are also full of personality and are bustling with activity. Every few pages there is a full-page, color artwork, but for me it is the margin illustrations that are most striking and effective — the full paintings feel a bit stiff and staged in comparison to the dynamism featured in the margins. I particularly like the illustration for the section of the book about squirrel hunting. It’s a straight-forward composition — the squirrels pour from a tree like cascading waters; the branches, fence line, and foliage all appear windswept by the rushing energy; it’s a force-filled image and one of the largest of the spot illustrations in the book. The text describes a time in the mid 19th century when gray squirrels were so widespread in New England that organized hunts would kill more than 20,000 squirrels per county. It goes on to describe an enormous southward migration of gray squirrels that “gathered in armies and troops, and traveled for weeks.” Gray squirrel migration is actually not something I was aware of before reading this book. Living in Connecticut I see these squirrels in abundance all year round and get no impression that they would need to travel great distances or cross dangerous terrain. It seems that population booms between 1842–1852 caused food shortages which pushed the squirrels to travel south and southwest en masse, a phenomenon that apparently returned in the great squirrel migration of 1968. We had an acorn mast here a few years ago but no population explosion large enough to cause mass exodus, perhaps the environmental changes of the past 50 years have altered the dynamic. As a wildlife rehabber I can’t imagine facing this kind of force of nature — squirrels flooding the roads, drowning in rivers, suffering from starvation, it would be a total rehabilitation emergency and I hope it will not pass through this area again. I discovered that this book also has a connection to SAIC and to the Field Museum as well. Walter Alois Weber is another SAIC alum and went on to have a successful and prolific career working with the Field Museum, National Parks Service, National Museum of Natural History, and most notably he served as a chief artist for the National Geographic Society until his retirement. While I found these early-career paintings in Homes and Habits to be a little bit lackluster, his later color work from the 40's and 50's are stunning, exemplary pieces of wildlife art — you can view a great slideshow of some of his National Geographic ornithological artworks here. Having lived in Chicago made his story all the more vivid to me as I could perfectly envision him walking down the museum steps and getting on the commuter train, recording his symptoms as he headed home to the suburbs. This little book is not too high on my list for artistic inspiration but the facts and stories I have uncovered through reading and researching it has made it a very worthwhile purchase. Sometimes the pathways a book leads you down are not within its actual pages. When I first began collecting books featuring natural history illustrations I spent most of my time following the signs for art, science, nature, or wildlife genres when visiting book sales and second-hand shops. I was looking for meaty books to weigh down my bag — a big collection of wildlife art or a fat encyclopedia were staples of a good haul. It took time for me to find my way into the children section’s crowded shelves of spindly-looking books. It’s overwhelming — there are more little books crammed into each square foot than anywhere else and the subject matter is completely random, you have to squint your eyes to read through all the tiny titles squeezed into all the little spines, it’s a true rummage. My first pick ever from the piles of picture books was Minn of the Mississippi, which caught my eye with its gorgeous cover art. I crack open any kid’s book expecting to see wise-cracking animals and cutesy forest friends, but Minn was a revelation. 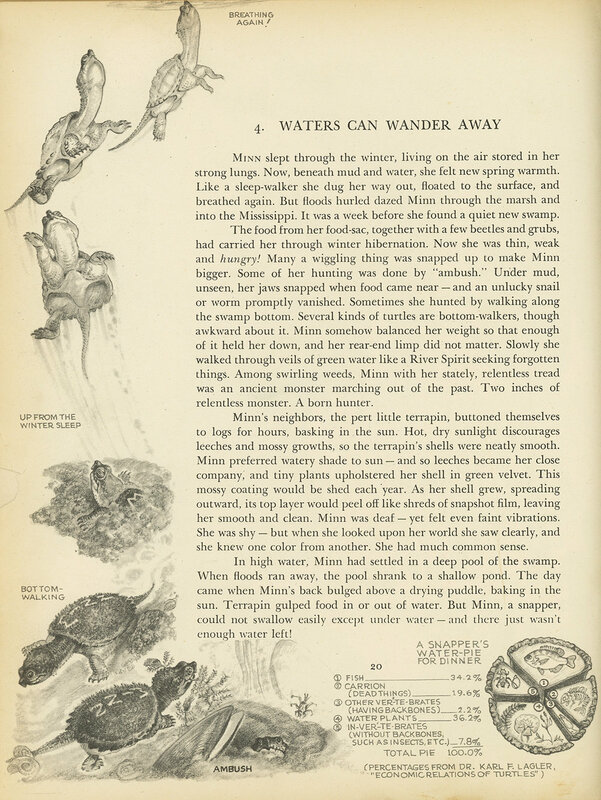 Almost every one of its scant 86 pages features natural history illustrations spanning the fields of zoology, geology, anthropology, engineering, and beyond, all interspersed among rich full-page color illustrations depicting the journey of the protagonist, Minn, a baby snapping turtle navigating the Mississippi River without gimmicks or magic. Minn faces the natural perils that threaten animals in travel, predation, and human encounters in a story that is true to life and permeated with facts about the habitats and history of the Mississippi River. This was my missing link; this unassuming little storybook converted the children’s section into a glowing treasure trove for my natural history collection. Minn of the Mississippi was written and illustrated by Holling C. Holling in 1951, and it was not until preparing this blog entry that I realized Holling and I had traced the same paths as alumni of the School of the Art Institute of Chicago and again by working at the Field Museum of Natural History — a nice surprise. The book is well-researched and includes an extensive acknowledgements section thanking a rambling list of contacts for contributing their expertise, more than I had expected to see in any picture book. Holling is an expert in his own right, and a real powerhouse: a dedicated researcher, keen observer, sharp technical illustrator, and expressive painter and writer — this book clearly required an enormous amount of time and effort and is a great merger of art and science. The writing shows an empathetic perspective on its animal subjects; the wildlife have feeling without being overly anthropomorphized and the style of writing and illustration is effectively simplified to communicate facts to young and adult readers alike. It’s an excellent example for contemporary science illustrators to look at for creating images for the general public that are engaging, concise, and tell a story without sacrificing the educational content. I love that our main character is a snapper — an unconventional choice for a starring species. She is brought to life by full-page illustrations that are lush and charming. There’s the nostalgia hit from the margins' graphite drawings framing the text, it's a classic look that dates the book in a good way. In a less good way, several passages portray Native Americans and African Americans as caricatures, there are some parts of the text that I really fumbled through. Here Holling explicitly highlights education as a driving force behind wildlife conservation and environmental protection. Like some other books I have read from this era, conservation is addressed through the lens of direct, hands-on impact — help replace the wood you gathered for your home, help restock the game you gathered for your plate. Holling addresses the reader and asks them to give more than they take with their own hands, it is not until later books in my collection that I see conservation more frequently discussed on a societal level. The sentiment to make a personal, positive impact reaches me 70 years since it was written, but today we also grapple with a greater sense of detachment from the effects of our actions as people ask how the choice to not use a straw affects sea turtles on the other side of the world, or how one can offset the global ripple effects of our daily consumptions and purchases. These concerns feel much more overwhelming (often defeating) than worrying about whether your local game preserve will be fully stocked for your grandchildren’s hunting needs. Part of this pain of detachment is what drives me to be an activist on the local level as a wildlife rehabilitator; seeing the direct impact of my actions to help an animal in need and educate the public helps give me the kind of affirmation and validation that keeps me from falling into pessimism. I too believe that education has to take centerstage, and I hope that the art I produce can help contribute to this mission. A vivid book like Minn may have made quite an impact on a curious young mind and inspired them to learn more beyond its pages. I think authors of children’s books must be seeking to create the kind of books they would’ve been enthralled with when they were children — they remember what originally inspired them and must hope to give that same feeling to the next generations. I am interested in seeing which scientists or naturalists are out there today writing and illustrating the picture books that will spark the next wave of nature-lovers, so I am expanding my book collection more and more out of vintage-only and into contemporary books. The glowing emerald palette and swirling light beams of Holling’s underwater scenes give Minn’s journey the same magical and epic quality of any fantasy book. Flipping through these pages generates the same feeling as when you find one of those remarkable fantasy books that has gone to great lengths to explain and diagram all of its fictional geography, societies, and creatures. This style of book is very effective in illuminating the reader’s mind to every detail of the world so they can be fully immersed in the adventure. The joy of natural history driven fiction like Minn is that when you close the cover, that world doesn’t close with it — the adventure continues right off the page and into the natural world. This 1961 book illustrated by Arthur Singer is one of the most striking in my collection. Over 700 species of birds are illustrated in this book, all nestled beautifully around the text starting with its elegant title page. I’ll apologize ahead of time for my mediocre scanning here, the book is heavy and too large for my scanner with my double page spreads — it was easier to put a bar over the seam rather than try to patch things up, I regret butchering this lovely book. This book and A Guide to Field Identification of Birds of North America are Singer’s best known works, the 1966 field guide is a classic birding reference considered by many to be a better introductory guide for beginners than the more well-known Peterson and Sibley guides. Singer worked as a designer and illustrator in advertising before switching to wildlife subjects and his sensitivity to creating compositions suitable for text layouts without interrupting the flow of the image is surely an echo of his prior training. The illustrations are airy — there are very few full backgrounds but this does not turn it into a static field guide of birds on blankness. The subjects and the bits and pieces of their habitats weave around the page in suspended moments. It is a lot to fit on a page but personally I enjoy the density. The book is packed but it doesn’t feel crowded or overwhelming, for me it feels rich and generous. Singer captures feather detail beautifully in a mix of gouache and colored pencil. 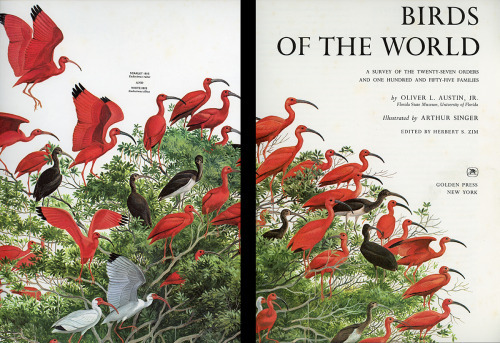 At the time of this book’s release some critical eyes were underwhelmed with several of his illustrations featuring birds from outside of the US — subjects he had no first-hand experience with and may have had less than perfect specimens or photographs to work from. it’s a reminder of the importance of quality reference material when venturing outside of subjects you have seen first-hand, and further proof that birders and bird appreciators make up one of the most astute audiences around (painfully so, at times). 50 years later we see this type of book is practically extinct. The lushly illustrated nature encyclopedias and animal guides of the past are out of vogue either replaced with photography or by online references, but we are grateful for the small boom they had in the 1960s and very excited to see contemporary iterations involving artists such as Owen Davey carrying it on. If you were anything like me as a child you may have dragged heavy tote bags of books like these home from the library and read them strewn open on the floor. Even if none of the written information made any sense to you the impact from the clarity and intimacy of their illustrations may have helped set you on the path to appreciation of nature and inspired the pursuit of drawing as it did for me. Photography will always have its leading role in the nature/wildlife genre and remains a bewilderingly difficult and intense art form in my mind — there’s no griping about photos here, only the hope that we may see more books of this kind in the future. I believe a fresh revival of this format would be very successful at this time. The field of natural science illustration is going through a growth spurt that could manifest new treasures if we are given, or create, the opportunity to do so. I’ll finish with this image, perhaps one of the most adorable pages in any of my books! There are plenty of plates for egg identification but not quite so many showing the “after” image front and center, the yawning is an especially perfect touch, and a final reflection of the calm nostalgia I feel after browsing a beautiful wildlife encyclopedia. According to the inner flap of this book’s dust jacket, Bruce Burk’s Game Bird Carving is considered to be the “bible” of bird carving. For me it was simply an impulse buy at a book sale — I had (and have) no plans to pursue carving but after flipping through the pages I knew this was a book I wanted in my collection. Bird carvers share all of the same concerns as natural science illustrators; their books are chock-full of the kinds of instruction and reference material that benefit all ornithological illustrators and artisans in any medium. If you want books with entire sections of anatomy photographed at various angles or advice on capturing the accurate posturing and proportions of birds down to the last detail then these are books you will love and visit often. Carving books also typically include step-by-step sections for painting feathers, iridescence, and other unique traits which are quite useful. Mine is focused on game birds but there are other books out there for more diverse species. Alongside plentiful reference photos there are many useful and well-executed illustrations which painstakingly depict the overlaying of feathers and measured anatomy of multiple species. The preparatory gridded diagrams that come before the carvings are great pieces in their own right and I find the instructional graphics in this book to be exceptionally clear and accurate. 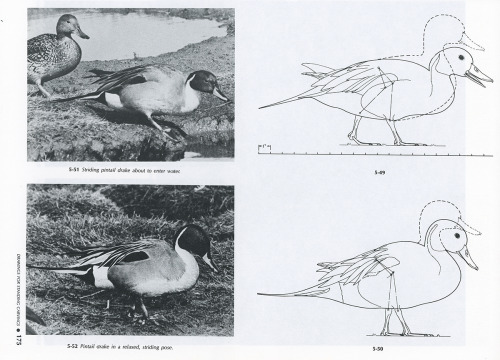 I love this example above with the gentle changes of the pintail entering the water and then in a relaxed pose. The information communicated here has a lot of heart — in a behavioral sense these are not particularly significant postures and would likely not be seen in a more scientific context. These images convey a sort of mundane information that is subtle and personal to the animal. At first glance these pages may look a bit plain and dry but I find them to be very touching little illustrations — measured, scientific diagrams of the quiet passing moments in a duck’s life, it’s kind of sweet. I must also express appreciation for the final results of this craft, there are great finished carvings throughout the book that I did not scan here but you can find many websites about realistic bird carving online to view examples. 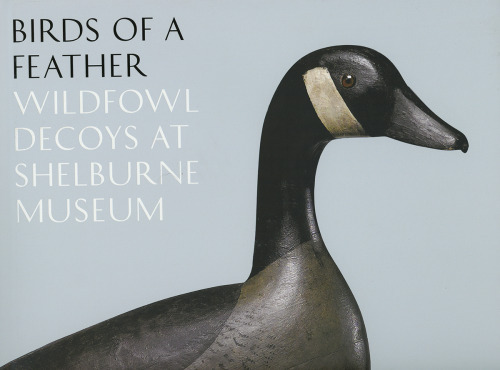 I want to contrast Burk’s book with this beautiful catalogue I obtained from a visit to the Shelburne Museum in Vermont where they have an incredible collection of over 1,000 carved decoys. I have a major fondness for American folk arts and crafts and I have used decorative motifs from colonial era quilt-making as inspiration for many of my compositions. Decoy carving has also become a significant influence on my aesthetic as it mirrors my own interest in reductive or abstracted styles of rendering birds. The birds in the niche of realistic bird carvings can rival taxidermy pieces with their detail and accuracy, but decoys go the other route in capturing the essence of the subject by pursuing the simple and the streamlined. I tend to go back and forth between realism and simplification in my own artwork so I really like having these two books in my collection to provide balanced inspiration. I am in love with radiographic scans of decoys and there are several examples in the beginning of this book. They are so amazingly haunting — dark, glowing, full of grim spikes and nails, and speckled with birdshot. The clash of serenity and violence is so dramatic. Of course they also tell us a lot about how the decoys are constructed which the book explains in detail, but it’s the aesthetic that really grabs me. An exhibit of just decoy scans blown up large on gallery walls would be really fantastic and impactful I think, unintentionally they evoke the ghosts of the birds that have been made into quarry. Even the most realistic decoys in the collection do not approach the life-like quality of the carvings featured in Burk’s book, most decoy carvers intentionally sought a very different path. They are rooted in what is utilitarian — what doesn’t need to be shown is stripped away. Historically there has been a split in philosophy where some believe the most realistic decoys are the most effective in drawing in birds while others are certain that styles that show just the essentials yield better results. All throughout this book you can see examples from both sides weaving back and forth between realism and abstraction. Enmeshed in that dynamic is the movement between tool and artwork, since many decoys are never set out for hunting and only made for decorative purposes. For some artists this means going forward with more detail and for others this means pushing further from it. One thing I especially love is the interplay of established graphic styles… you cannot tell where the sometimes cartoonish folk art styles of the 19th century end and the modernism of the mid-20th century begins — they are all guided by the unchangingly bold and stylish plumage of game birds and the movement toward showing only what is necessary. If the realistic bird carvers capture their subjects by working down to the tiniest feather and scale, decoy carvers do it by working down to the most basic essence; the realists vividly describe the subjects at length while the decoys charm us with a single line of poetry. I could not guess the species when I saw this cluster of shorebirds above and was surprised to learn that they were intended to be Lesser Yellowlegs as none of them are sporting yellow legs at all — or leg, in this case. Shorebird decoys were typically built on a single wooden dowel that would be stuck into the sand and were commonly referred to as “stick-ups.” This is a missing detail that might baffle a birder or ornithologist; it’s easy to dismiss this representation as being simply “wrong” but the occasional wrongness and wonkiness of folk art is part of what makes it so lovable. Their focus here is on the attitude and silhouette of this bird — they recognize that there is so much more to this species than its namesake. Look how alive these funny little decoys are! These are identical decoys — all the exact same shape simply rotated at different angles. The silhouette and pose are so perfect that each one feels uniquely poised and alert despite being a copy of its neighbor, and the more I look at it the more vividly I see the familiar presence of the Yellowlegs that I see every year in the our marshes captured in this simple form. It encapsulates how I feel about so many of the images in this catalogue — perfect and imperfect all at once, and not at all lacking for what has been taken away. I could not finish this post without including this amazing oversized slat goose. At 62 inches long it is absolutely worth trying to see in person. The book offers no explanation for this lovable giant, he is a delightful mystery… As with this goose, there are lots of quirky examples in the book that just “work” for some reason, even the weirdest decoys have a special something about them where you can tell the artists really knew their subjects well even if they didn’t carve and render every single detail. This is really a fantastic book and the best decoy collection I have ever seen. Visiting the museum and spending time with this book really solidified my love for these carvings. At one time they had just seemed like unremarkable decor I would sometimes encounter in peoples’ homes or antique shops; I hadn’t really been exposed to exceptional examples like the ones in this book nor had the opportunity to see their stylistic evolution laid out before me. I highly recommend visiting the Shelburne Museum to see these pieces in person if you are able, and the catalogue is available for sale in their online shop. Thanks for reading more of my book blog! I hope this shares a bit more about how I have been influenced by other types of bird artists and craftsmen outside of painting and drawing, we all have so much to learn from each other. This entry marks the beginning of my book blog covering selected items from my collection. 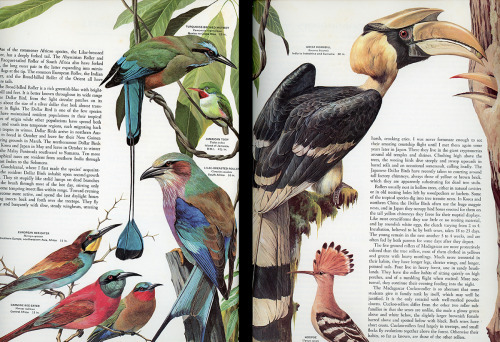 Most of my books are focused around birds and natural history illustration, and nearly all of them are second-hand or vintage. Our American Game Birds was first published in 1917, and mine is a 1947 edition. In the Natural Science Illustration group on Discord someone asked whether hunting or game illustrations count as natural science illustration, and I firmly believe they do. Whatever your stance on hunting may be does not detract from the validity of observations made by hunters/anglers and the many stunning examples of artwork in this genre. The best of these hunters are excellent naturalists and contribute strongly to conservation efforts — our foreword’s author, Theodore Roosevelt, case in point. The hunter-illustrator can clock an immense number of hours in patient observation and hands-on study that can lend a great deal of accuracy and presence to their work. Lynn Bogue Hunt is my favorite in this genre, his paintings stand out stylistically from the rest and artfully demonstrate the depth of his first-hand knowledge of these species. The use of color and composition in these artworks is very striking. I find them to be quite expressive and sophisticated — the post-impressionist influences, glowing sunset lighting, and flattening of space blend together in a way that makes me feel a bit like I am peering into a birds’ dreamland and all the birds are peering back. Repetition is a given for artwork of flocking birds but the way he arranges and abstracts the subjects is very thoughtful and musical — the subjects are the perfect balance between the patterns of nature and the patterns of a successful composition. These paintings feel so self-aware, I can’t really explain it, they just have an aura about them. The woodcock chapter features one of the most dramatic images in the book, but Van Campen Heilner’s text is a bit of a rollercoaster. It starts off with a very casual mention of his former woodcock hunting companion committing suicide with his shotgun and finishes with a little story about how “there is probably nothing finer than woodcock on toast.” Somewhere in the middle he talks about woodcocks making odd appearances in cities, which still holds true 100 years later despite how much the landscape has changed. I remember running into one in downtown Chicago 12 years ago, that was before I knew much about birds and the encounter was completely baffling. If you have ever seen and heard this bird fly you’ll understand why. This bird is so plucky and humorous but Hunt gives us the woodcock’s serenity and majesty that often goes unrecognized. One of my favorite books in my collection and one of my favorite bird artists, and I hope this will be a good start to this blog! Thank you for following.